One of my favourite authors, Sandra Gulland, appears to like butternut squash soup. In fact, THIS butternut squash soup. I am not sure I cook on par with how well she writes, but I think I might agonize in a similar way when deep in the creative process. I can have a similar frustration when preparing a dish that I want to be particularly special. I was making a tried and true autumn soup as my contribution for our October book club meeting’s lunch. With Sandra Gulland as our honoured guest, I wanted to fuss a bit. Not only should it be a soup with delightful flavours, but I wanted it to be exceptionally pretty. Sandra’s ingredients are her words. Common to everyone but so unique when put together her way. Sandra writes historical fiction. As a result, the characters and the setting have already been revealed to the world. But she plays with her words and her expectations to make the characters and settings deeper and richer and more colourful than we might have first imagined. This she has proven 4 times over with The Josephine B. Trilogy and her latest book, Mistress of the Sun. My ingredients are the bountiful foods of the garden, the aromatic spices in my many jars, the staples in my pantry, fridge and freezer. 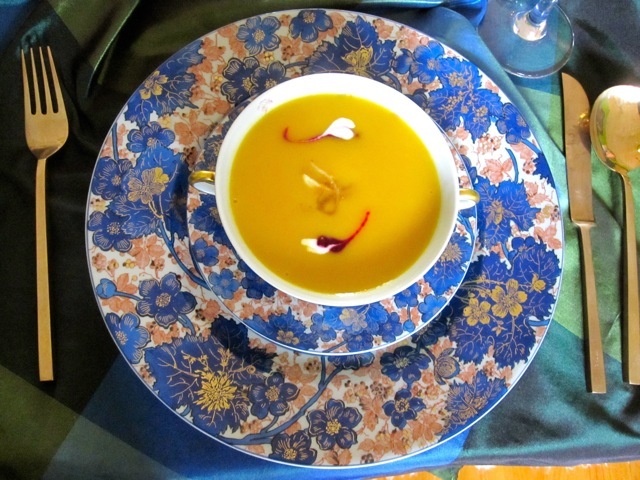 Butternut squash soup is not unusually complicated and those who make it often, likely have recipes very similar to mine. There are classic combinations that work. Squash with refreshing fruits, such as pear or apple. Squash with curries. Curries with coconut milk. Nothing new and clever here. The right balance of flavours and textures though could produce a bowl full of goodness leaving you wanting for more. I actually made my soup days ahead and put it in the freezer. A step I often feel lends itself to improving soups, stews and sauces. I am sure there is something scientific going on in the freeze-thaw process that is flavour friendly. I don’t profess to know what that is but time and time again, I have been pleased. The day I was making this batch of soup, I was shouting it out on Twitter that the squash and apples were roasting away in the oven in preparation for soup. And out in the big wide universe came the voice of Marion Kane, saying something to the effect that ‘You have inspired me. I think that is what I will do with my butternut squash too.’ In that moment, we were ‘Kitchen Sistas’. I was making soup with food sleuth, Marion Kane! She, somewhere out there in her kitchen on a cold, rainy autumn day, was creating similar smells. This soup was now having very good karma. The results were pleasing. But then I got stuck. Stuck finding the heart of my soup. I just couldn’t serve up a sea of ‘yellow-orange’, could I? I knew that I wanted it to be stunning to look at and that whatever I did in plating had to also complement the tastes. Twitter and friend requests to the rescue. Suggestions abound. A drizzle of thinned yogurt. Vidal ice wine syrup mixed with cream. Croutons. Fried onions. Dried apple flakes. (I don’t even know what that is.) Chives. Parmesan crisps. I played and tinkered with ideas. Some I dismissed right away. The Vidal ice wine syrup intrigued. I followed the suggestion of mixing it with cream. Although tasty enough, it had a very muddy look. It didn’t help that my drizzles looked liked grating shards. I was ready to give up. My timetable was collapsing around me. I was at risk of being away the day of the meeting. If necessary, soup would be delivered ahead of time, as is. I was content that it had a wonderful taste and so a sea of brightness might just have to do. The night before our special gathering my schedule realigned and, as an added bonus, I had a stroke of genius. My fridge was sporting a small bowl of leftover roasted beets. How did I miss this? How did I get so stuck? The technique is not mine to claim and perhaps in its day was overused. But I loved the idea of using a beet coulis, accented with a yogurt coulis to create trumpeting heart-shaped flowers. Have you ever made a trumpeting heart-shaped flower with coulis? It is best to have the coulis in easy to manage squeeze bottles. The size of the opening is very important to get the right size dot. Consistency is important too because you don’t want the beet or the yogurt to bleed out when the dot is laid on the soup. The beet dot is the larger of the two. The yogurt dot lays on the edge of the beet dot. Then putting a round toothpick deep into the soup, pull through the yogurt, then the beet and artistically pull a gentle curl. The colours would be spectacular, I thought. I had also prepared a bundle of apple slivers. No time for a dry run. The plating creation would unfold the next day as we were about to serve. The Vidal ice wine syrup came along for the ride. My confidence was somewhat restored. I was beginning to feel that maybe I had found the heart of my story. Then something dawned on me that I had totally overlooked. An unforgivable oversight considering my many hosting experiences. I had given absolutely no consideration to the vessel being used to serve the soup. I knew nothing about the dishes being used by the book club hostess. She decided to pull out all the stops and laid out the table with her finest. What luck. The yellow-orange of the soup, the deep purple-red of the beet coulis and white of the yogurt would look striking surrounded by the majestic blue in the delicate china. As the first ladle of soup hit the bottom of the bowl I knew this plating was going to be very showy, considering the decorating that was about to unfold. And so we made it up on the spot. The bowl was not broad and the flowers should not be crowded. Just a pair would fit. I chose to have my flowers tail out in opposite directions since there was only two in the bowl. There was room for a nest of apple slivers in the middle. Why bring the Vidal ice wine syrup all the way across town and not use it? After all, I paid a fortune for it. A splash covered the wee nest of apple. We worked together quickly, I ladling and my favourite epicurean enthusiast, just trained, drawing trumpeting heart-shaped flowers with coulis. Then servers bustled 12 plates as quickly and safely as possible to the dining room so all would have theirs piping hot. It was a very last minute idea but I sense those fussy, swirly, decorative beet flowers were in keeping with the bold, elaborate fashions of the 1600’s and the time of the Sun King, Louis XIV of France. Maybe, maybe if we squinted really hard at them, we could make out fleur-de-lys. Heat the oven to 375ºF. Cut the butternut squash lengthwise. Dig out seeds and pulp. Rub open flesh with olive oil. Sprinkle with salt, pepper and cinnamon. Place on a large baking sheet, flesh side down. Bake in the oven for 25 minutes. Cut the apples lengthwise. Rub open flesh with olive oil. Sprinkle with salt, pepper and cinnamon. After the squash has baked for 25 minutes, add the apples to the baking sheet, flesh side down. Continue to bake the squash and apples for 20 more minutes. You will see that the apples have ‘exploded’. Pierce the squash with a skewer to see if it is fully roasted. Let the squash and apple cool long enough so they can be handled. Scoop out the squash and apple flesh. Note that you will need to remove the apple seed core if you had not already done so. It is easy to do since the flesh is so soft. Dice two small onions. Sauté the onion in vegetable oil until it has softened. About 3 minutes. Add the grated fresh ginger. Continue to cook to release the flavours. Another minute. Add the Thai red curry paste and cook for a minute until the onions and ginger are covered. Add the flesh of the squash and apples. Mix with the onions, ginger and curry paste. Add 5 cups of the chicken stock and simmer for 15 minutes. Purée in the Vitamix or blender until silky, smooth. Add warmed chicken stock to help blend if the soup mixture is too thick. Put the blended soup into a clean pot. Add enough chicken stock to bring it to the right consistency. Remember, you will be adding a bit of coconut milk later too. Apple juice is nice for thinning as well but don’t over do it as it will make the soup too ‘appley’. Heat the soup through. Add the coconut milk. Adjust seasoning. If you would like a bit more heat, add a bit more curry paste. More coconut milk can be added if you over spice the soup. Play with the flavours until you get the right blend. Season with salt. I like to freeze the soup until I need it. You will find the coconut milk will appear to have separated once it is thawed. It will come back together once heated. *Update (Oct 27, 2011) – found this great post on roasting beets. Great pictures too. Pretty much the same way I do it. Worth the read. Purée in Vitamix or blender. Add splashes of red wine and maple syrup to make it silky smooth but it needs to stay relatively thick. Not runny. When using to decorate the plate, place the beet coulis in a squeeze bottle to control the ‘dot’ being placed on the soup. Another reason why it shouldn’t be too runny. For control, you don’t want it coming out of the bottle unless you squeeze it. Thin yogurt with cream. Place in squeeze bottle. It should not come out of the bottle unless squeezed. The hole in this bottle should be smaller than the hole for the Beet Coulis. Heat apple slivers in apple juice in small pan. Add butter and sugar. Heat through until the liquid is absorbed into the apple. This can be made ahead and refrigerated until plating time.